This is the question that many users wants to know: How much performance drop of my Video Card i will have if i put it in the eGPU with Thunderbolt 1, Thunderbolt 2 or Thunderbolt 3? I will give you the answer in this thread! Thanks to @theitsage we finally have result with the same CPU in the same Desktop PC with attached to the motherboard Thunderbolt 3 port eGPU (AKiTiO Node with GTX 980Ti 6GB Hybrid) and the results shows the same close to ~20% percent performance drop with External Display for Thunderbolt 3 (32Gbps)! 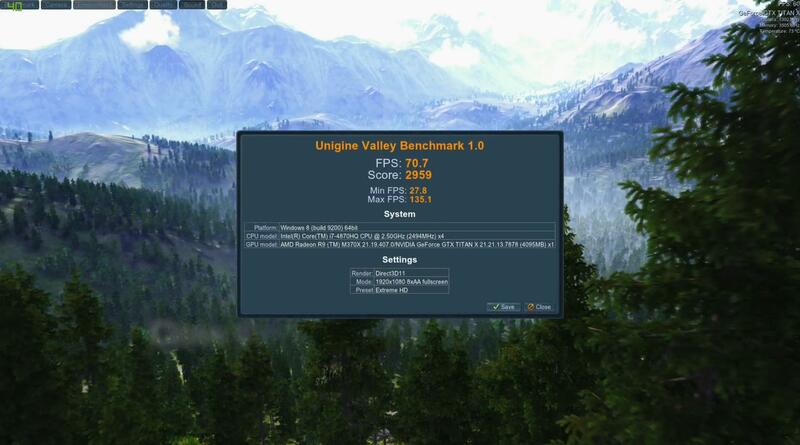 So after that test we can confirm that all results we saw so far in this thread are true story even they are with different CPUs and some GPUs are overclocked! So we can see from all benchmarks that with Thunderbolt 3 (32 Gbps) with better Video Card we will get more performance drop, its because again of FPS and bandwidth! Also with GTX 1060 6GB will give us the same 21-22% performance drop thanks to Thunderbolt 3 (32 Gbps) on Internal and External Display! 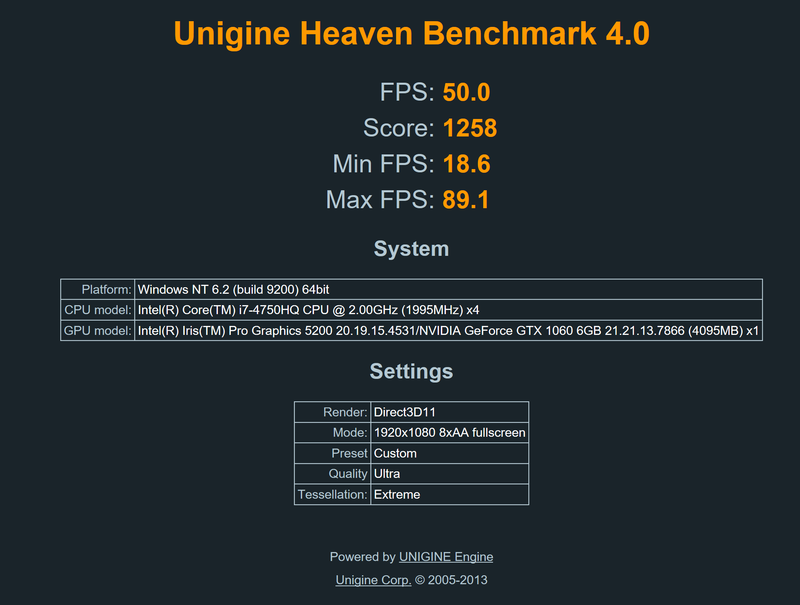 To us eGPU users, the performance loss compared to a desktop is negligible. @enjoy don't you think there is something wrong with Jay setup? 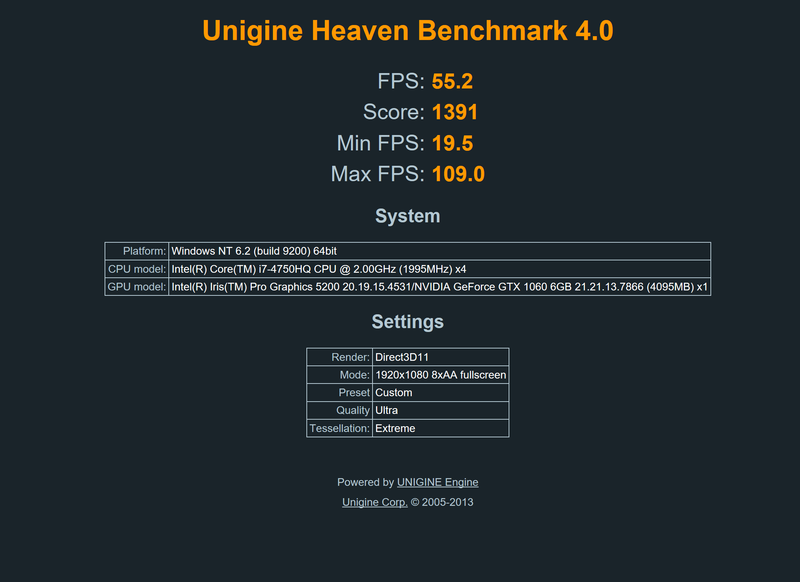 How is he getting so low numbers with eGPU? 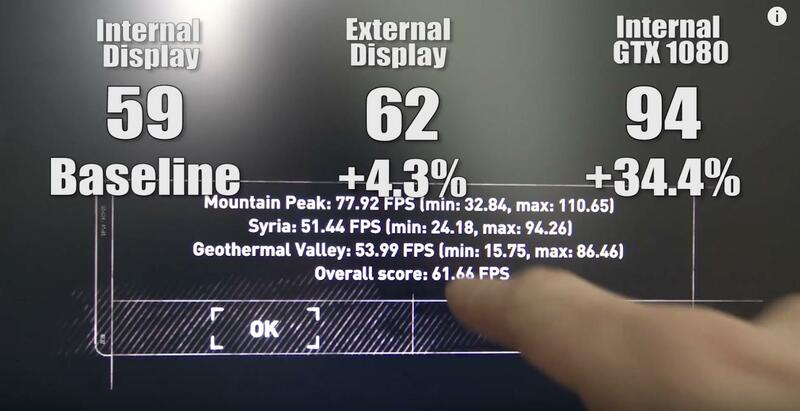 How is Dave2D getting 10-15% drops even with this tablet? Also TB1, 2, 3 all have same loss on external monitor? How is that even possible? 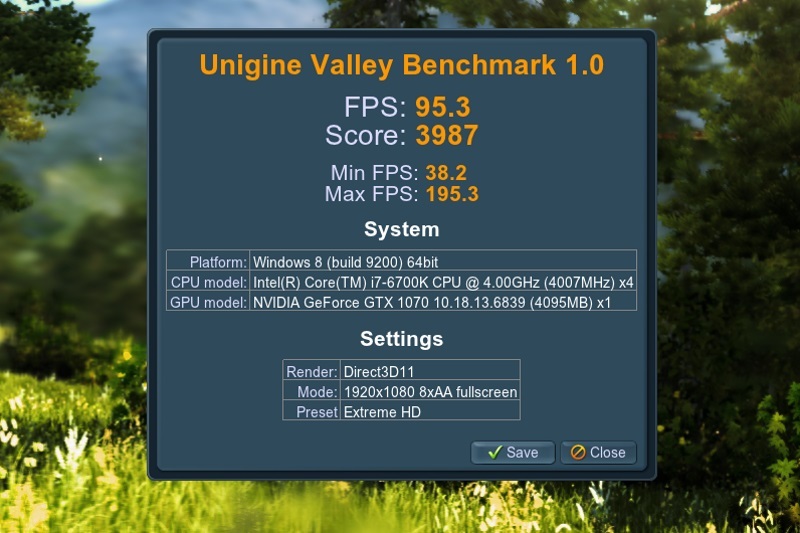 @t0panka It's because he used slower Video Card in the eGPU and he gets lower FPS, i will update the first post with that! 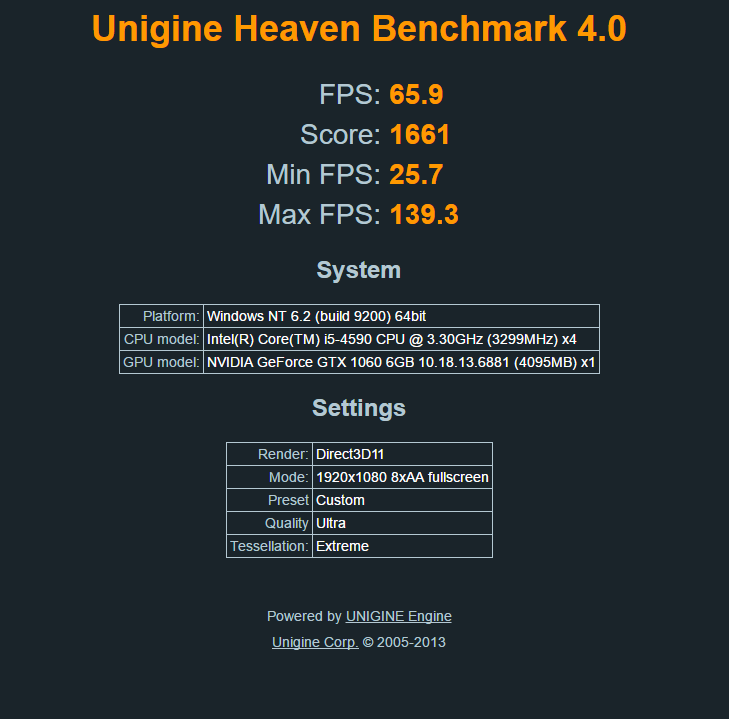 The post is about heavy games performance drop. @enjoy thank you very much for explaining! Thunderbolt 1, 2 and 3 all have the same -20% performance drop vs. PCIe on External Display with eGPU on 1080p! 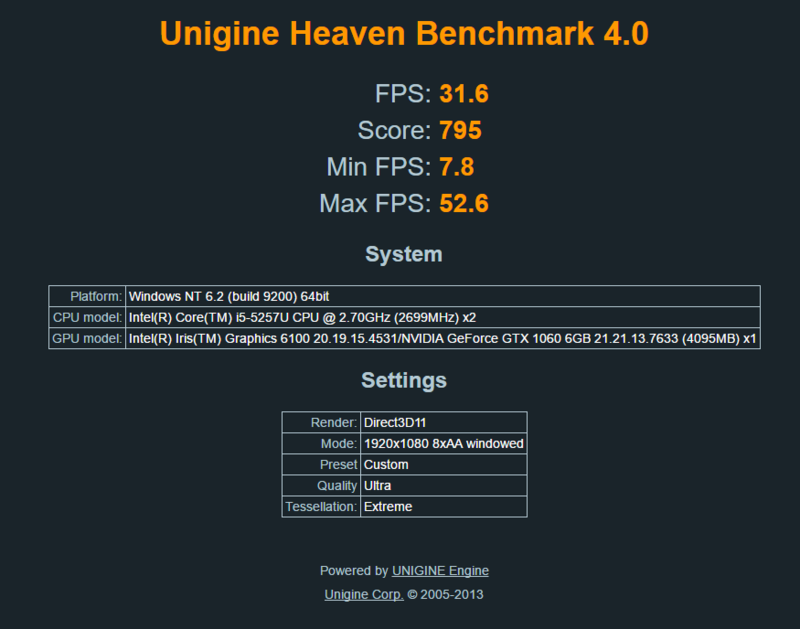 On Internal Display the same video card (EVGA GTX 1060 6GB SC) with Thunderbolt 3 on the Same laptop MacBook Pro (13-inch Late 2016)Intel Core i7-6567U @ 3.3 GHz (2 cores) - Thunderbolt3 (32Gbps) - /Geekbench 4 score - 4016/ will give us the same score on Heaven 4.0 like on the Internal Display - still 20-22% performance drop vs. PCIe! This test with the same Video Card show us that, Thunderbolt 3 is the best right now if you want to use Internal Display, but Thunderbolt 1 and Thunderbolt 2 are still in the game if we lower the resolution or just use External Display! 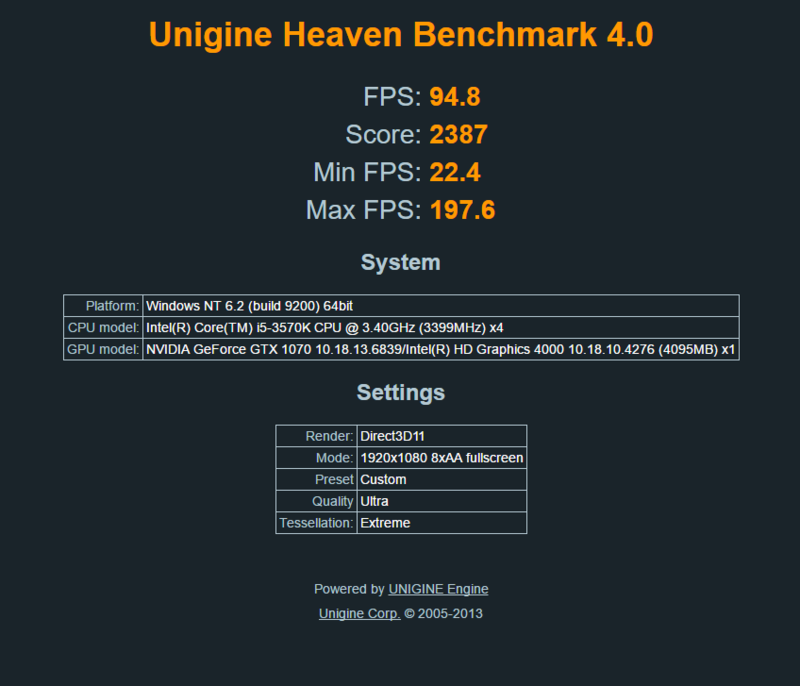 The score obtained with a dual-core processor is indeed lower than the score obtained with a quad-core processor (as enjoy mentioned). Thanks for the tests! 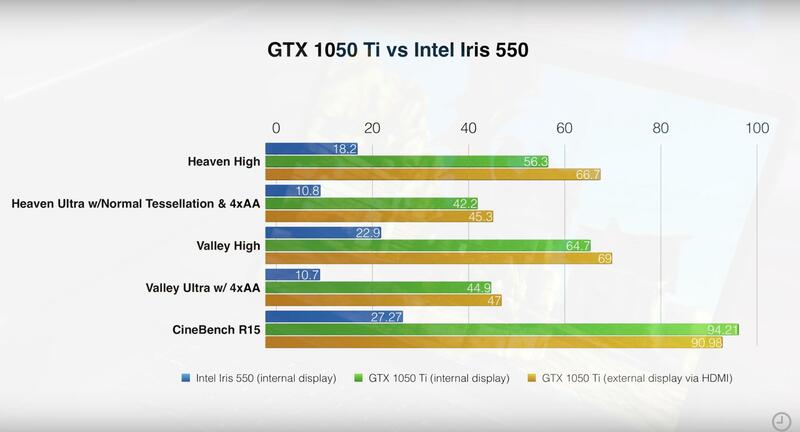 So with an iMac late 2013 with TB1, a GTX 1060 should have the same Performance like a GTX 1080? 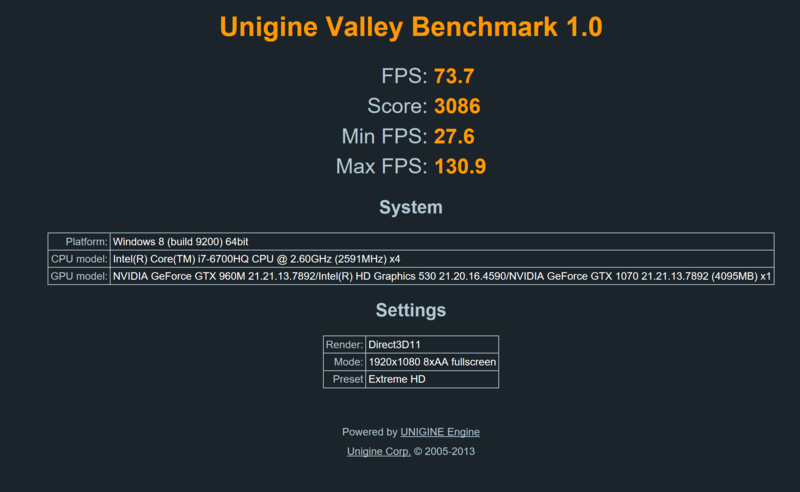 @Gotsche - No, 1080 will performance better, here we test the performance drop of the GPUs! 01. 1060 (eGPU) vs. 1080 (eGPU) Internal Display test on 2016 MacBook Pro 13"
I want to use the internal display of the iMac because of no room for another Display... - the iMac is placed (removeable) at the dining table. No own room anymore since the child was born. According to my opinion the gap is less then 17% because the difference in terms of cpu performance between desktop environment and laptop one affects this kind of benchmark. Most of the eGPU users wants GTX 1080Ti, thanks to @konceptz we can see that we have -20% performance drop of the GPU on external display, on the Internal Display we have only macOS benchmarks but -35% performance drop was expected even for Thunderbolt 3! Even on TB1 - External display it's still preforming great. Nothing to worry about! An other interesting thing to explore is the performance drop is influenced by architecture (Pascal vs Maxwell). Is worth to buy an old 980 or a 1060 ? The amount of dram vram is a variable that increases the drop ? 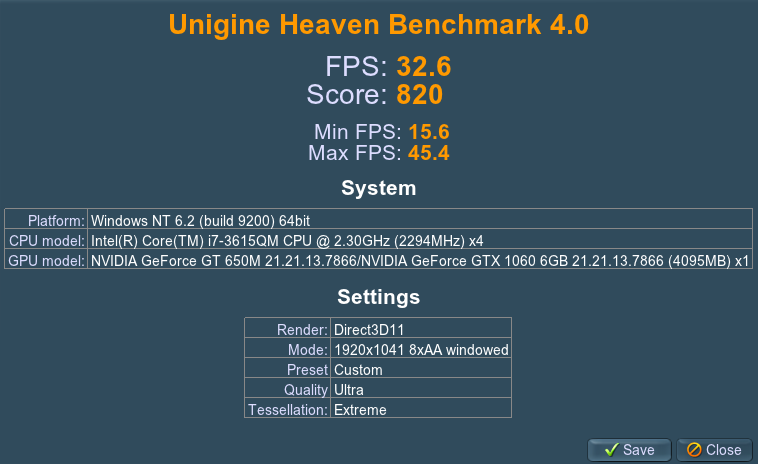 I sent you you a message but if you inspect the heaven benchmark you will see that the desktop implementation should not be considered reference. There is an over clock on the gpu core and the memory. Huge gap man, more than expected... the % difference is really high in external (35% approx and not 20%). I am a little bit dissapointed. There is anything that can be improve in order to stretch the gap? 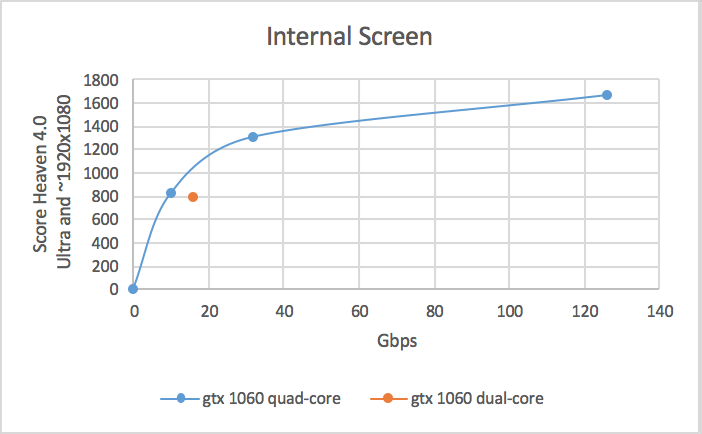 It's actually the opposite...the higher the resolution and the more stressed the card is, the smaller the performance gap becomes compared to the same card installed in a desktop. 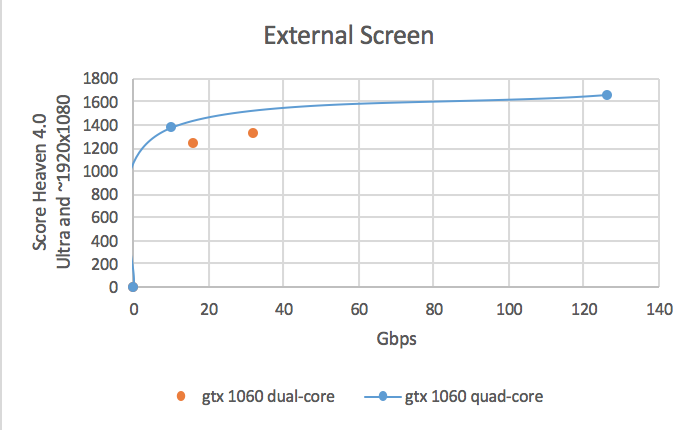 The bottleneck starts to shift from PCIe bandwidth back to raw GPU performance. 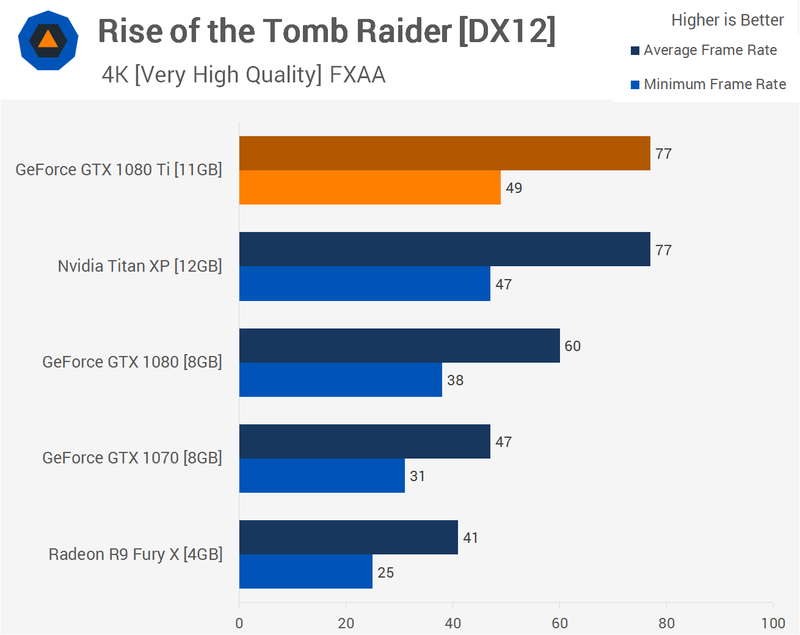 In your Tomb Raider benchmarks above, at 1440p, the desktop's 1080 performs 24% faster than the eGPU one, but at 4K, the gap narrows to 22%. For a few games, I've targeted 60fps and simply raised image quality as high as it could go, even invoking DSR in games that don't have a native supersampling setting. I have a lot of my games rendering to 3K, sometimes 4K resolutions to then be downsampled to the 1080p monitor...not only does this look crispy as hell, it reduces the apparent performance gap when compared to the card in a desktop. 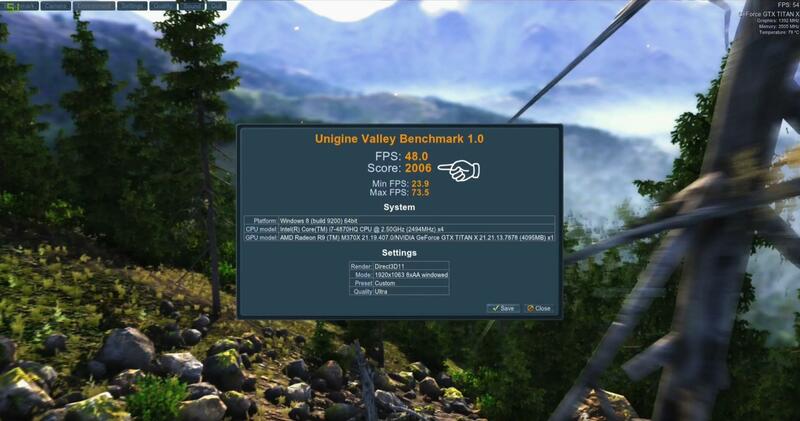 Another case in point, in Unigine Superposition (1080P extreme preset...a very compute-heavy benchmark), my TXp eGPU performs within 7-10% of desktop TXp results. This is probably a dumb questions. Can you utilize both TB ports at the same time? TB2 box has two ports, as does my iMac. The second TB2/TB3 port on the AKiTiO Thunder/3 is for daisy chaining additional devices down a TB2/3 channel. There is no performance benefit in attaching the second port to your iMac. If anything, it may be an invalid configuration preventing the TB channel from working. 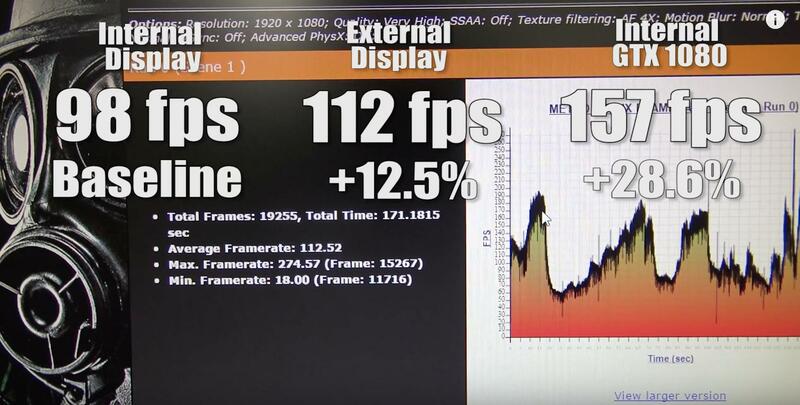 We must wait @theitsage to test with the same processor in this thread, and then we can compare the final results, but it's seems that for External Display (Monitor) [->] we have 20% performance drop for 1080p & 1440p and 10% performance drop for 4k, on Internal Display [<->] we will have big performance drop with higher resolution for sure! The performance drop is down when we up the resolution because we have lower FPS... But we need tests with the same CPU - to attach Thunderbolt3 eGPU to Desktop PC with Thunderbolt3 motherboard and test the real performance drop, because here we don't have real stats because we have different CPUs models and speeds! 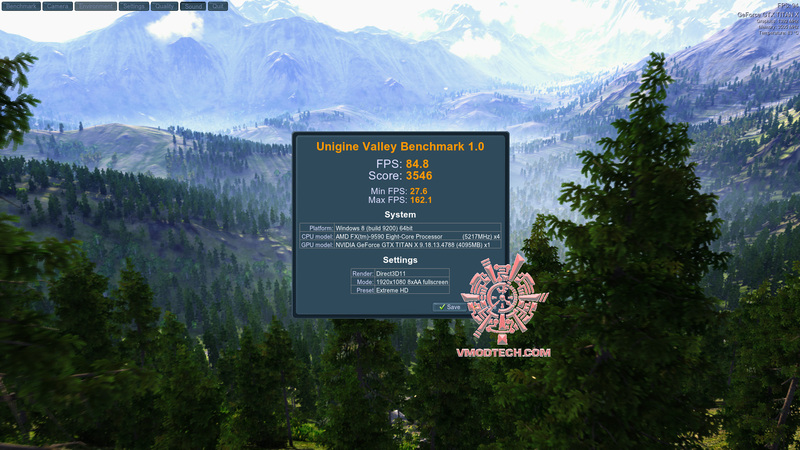 With 15" 2016 MBP with AMD RP 460 At 3440 x 1440 on Battlefield 1 I'm getting 55 - 60 FPS on Ultra compared to 86 - 92 FPS when I had it inside a gaming rig 6600k OC'd to 4.6Ghz. 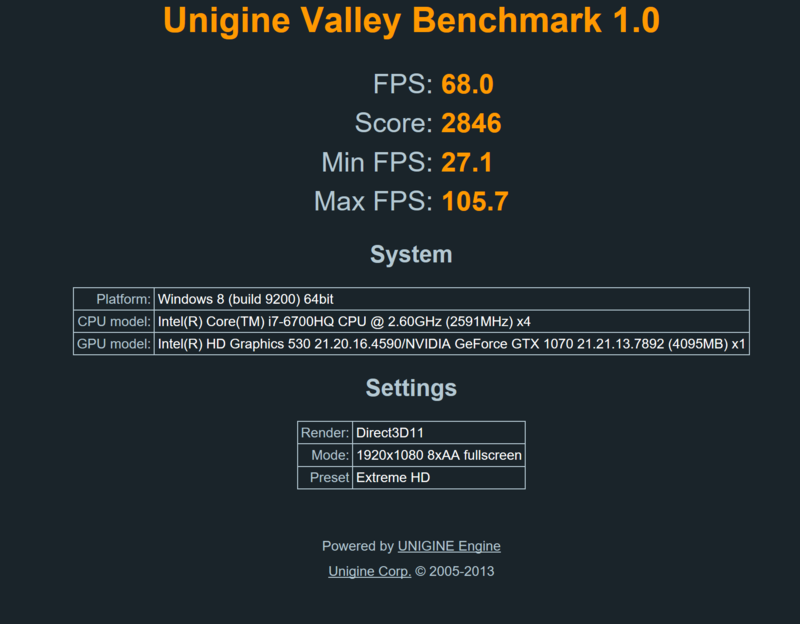 It's a shame I can't test the same setup while keeping the same processor. I’d like to add that, for 1080p gaming, I think Enjoy is bang on. I think the situation changes somewhat though for 4K Gaming and gets more complex. When you go from 1080p to 4K on a desktop GTX1080 fps is going to plummet obviously. 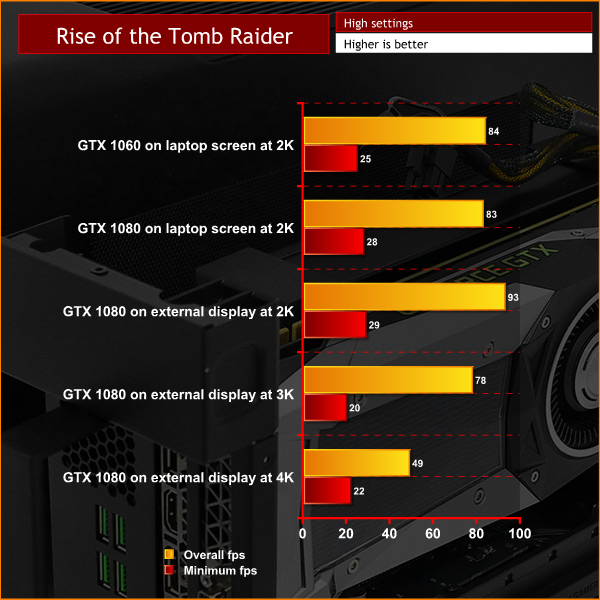 For example, Rise of the Tomb Raider (at max. 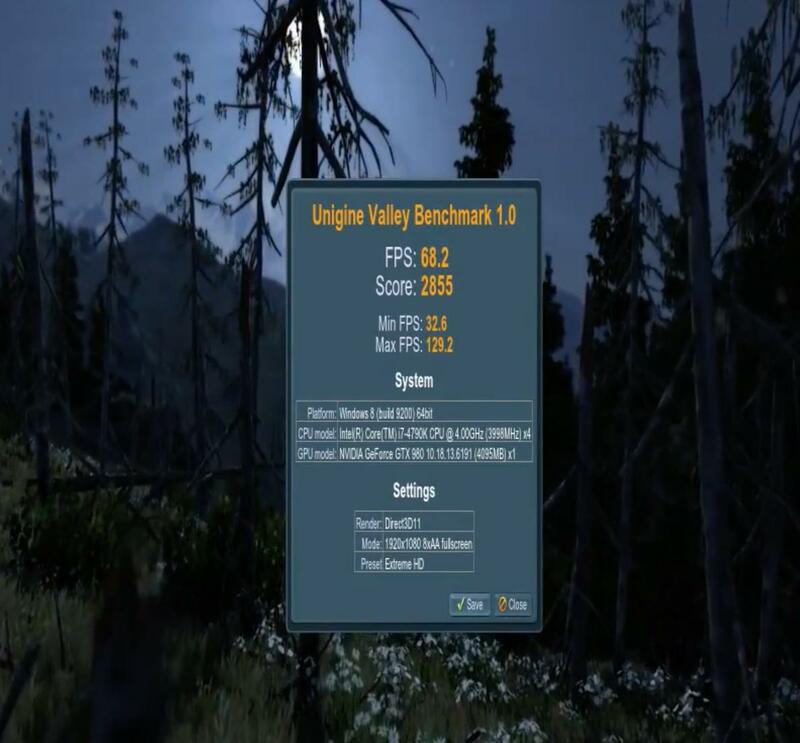 settings) goes from ~100+fps down to~47fps. On an eGPU GTX1080, the fps at 1080p shows a huge loss against the internal GPU at ~59fps, but at 4K, I’m also getting ~47fps on an eGPU. So, as you go up in resolution things start to even out—somewhat. If only it were that simple. The thing is these performance deltas seem to vary a lot over different titles and applications. So, for ROTR, I think I’m getting somewhere around the numbers that a desktop GTX1080 is getting at 4K. Well optimized games like Battlefield 1 have me approaching 60fps at 4K, maxed out! I think that’s insane for an eGPU. I have to be clear, that I’m heavily overclocking, and also that this can only be done with a really good power supply. But, nevertheless, this all makes me feel the GTX1080 was worth it. On the other hand…. Badly coded titles bring the dream of a GTX1080 in an eGPU down to a depressing slog. 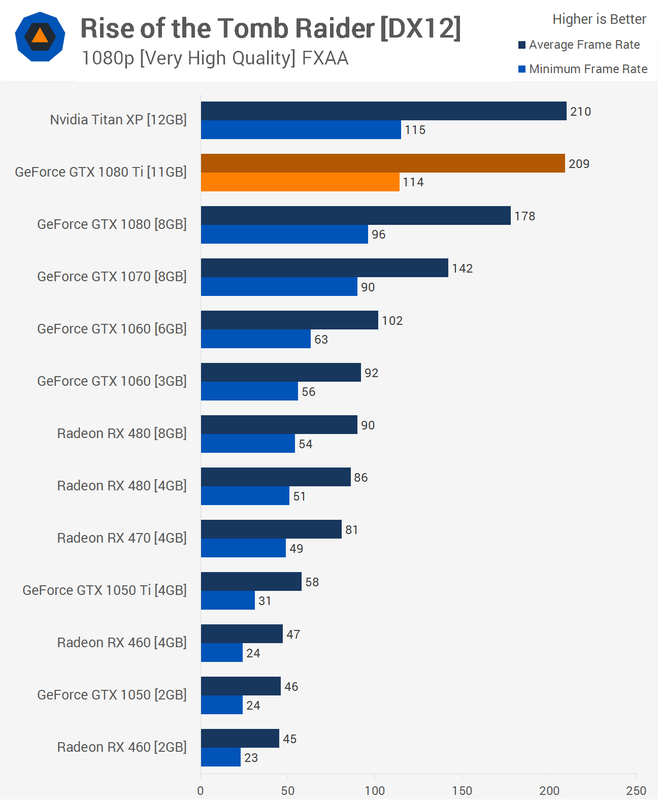 Enjoy showed graphs for Andromeda. Andromeda is just the worst, for so many reasons (and yet, I still want it to be good). Just as Enjoy was writing his post I was trying to get Andromeda in 4K-3D to be playable at any settings, and I couldn’t. Seeing 12fps come out of a GTX1080 really takes the wind out of your sails. In the end, I had to use med. 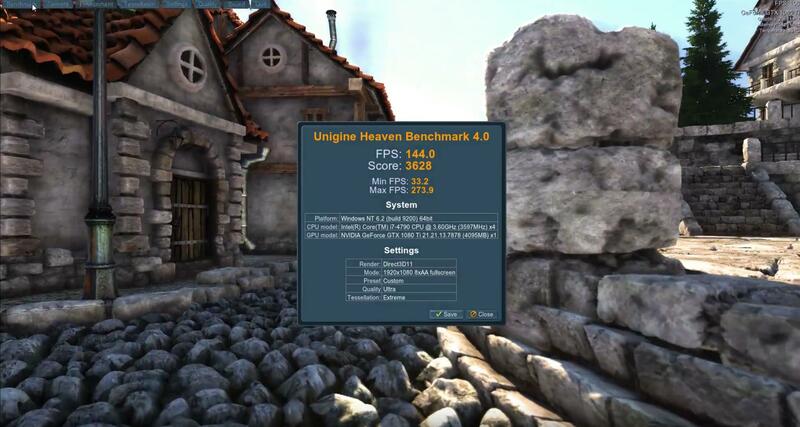 settings and scale resolution to 80% just to get it to 20-24fps. 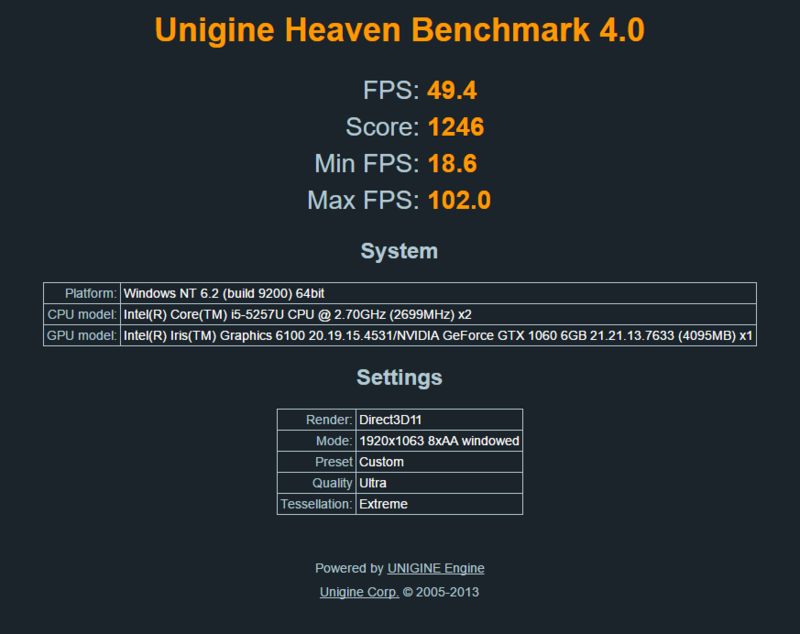 In this case, I’m sure I could do way better if I just threw my components into a mini-ITX build. So, if you’re thinking of a GTX1080, you really have to consider your specific application. 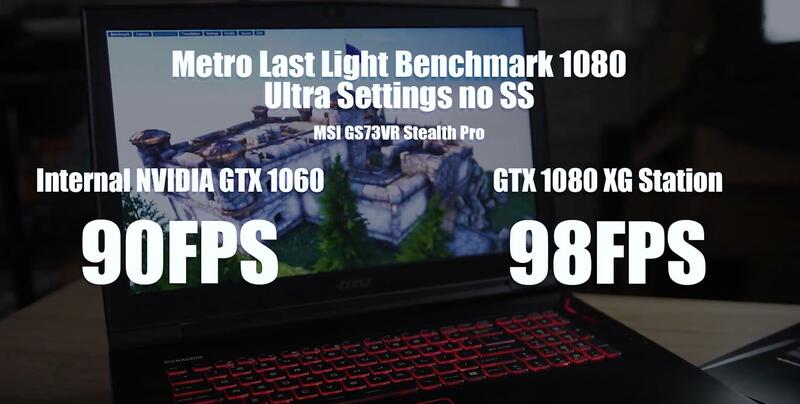 We know that GTX 1060 is the king of eGPU as with it we have the same performance like top brands gaming Laptops because mobile GPU inside Razer Blade for example are down voltage and have slower performance from Desktop PC GTX 1060, the question is - Is it worth to have 1070, 1080 and 1080Ti in eGPU?.... and the answer is YES if you use External Display (Monitor) you will have only 20% performance drop on your GPU vs. if you put it in Desktop PC. For 1440p and 4k with External Display (Monitor) we have even less performance drop, because the FPS is slower maybe something about only 10% performance drop for 1440p and 4k. So YES eGPU and high end GPUs can life together. If you want mobile Laptop for travel and work and to have eGPU at home for gaming- eGPU is for you. I hope that this thread will help users to understand the performance drop it is 20% performance drop on External Display at 1080p and more than 30% performance drop if you use your Internal Laptop Display at 1080p based of your Thunderbolt number and GPU - we can finish with that conclusion. The next step is that we at eGPU.io will test Thunderbolt3 with the same CPU so be ready for more clear results! This is super interesting. 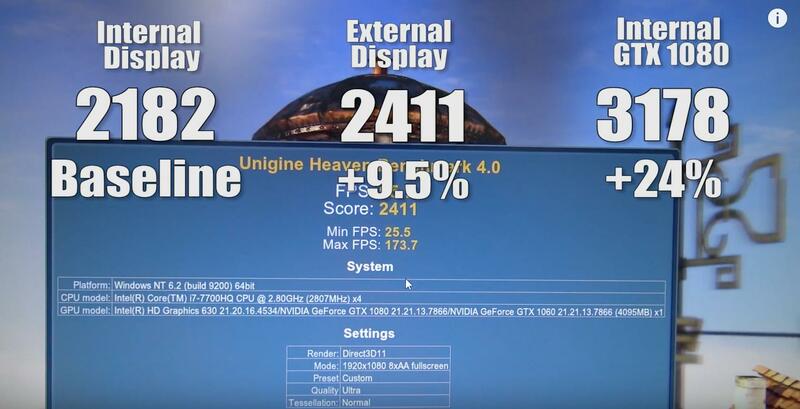 If I read that right, a TB3 computer with quad-core i7 6700 2.6GHz processor and 1070 got 73.7 FPS in 1080p on Windows. My TB1 mid-2012 Retina MacBook Pro 15" with quad-core i7 3720 2.6GHz processor (same clock speed but much earlier and therefore should be lower version) got 73.2 FPS. That basically means the new CPU and TB3 vs TB1 makes basically no difference on an external monitor.